Reyna knows her relationship with Boyd isn't perfect, yet she sees him through a three-month stint at Riker's Island, their bond growing tighter. Kiki, now settled in the East Village after a youth that took her to Turkey and other far off places--and loves--around the world, admires her niece's spirit but worries that motherhood to four-year old Oliver might complicate a difficult situation. Little does she know that Boyd is pulling Reyna into a smuggling scheme, across state lines, violating his probation. When Reyna takes a step back, her small act of resistance sets into motion a tapestry of events that affect the lives of loved ones and strangers around them. A novel that examines conviction, connection, repayment, and the possibility of generosity in the face of loss, Improvement is as intricately woven together as Kiki's beloved Turkish rugs, as colorful as the tattoos decorating Reyna's body, with narrative twists and turns as surprising and unexpected as the lives all around us. The Boston Globe said -No other writer can make a few small decisions ripple across the globe, and across time, with more subtlety and power, - and Improvement is Silber's most shining achievement. 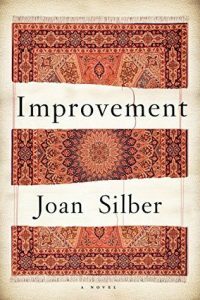 The cover of Joan Silber’s Improvement features a carpet that is woven into the connective stories. 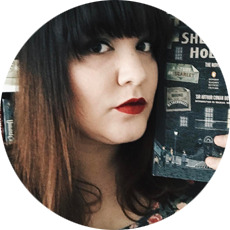 The novel is written in sparse, well-crafted prose, and connects the stories of six characters through strong, thin threads. I loved the butterfly effect explored in these pages, and Silber seems to know just what to reveal and just what to led the reader consider for themselves in the connected narratives. I love how the novel itself is structured with an overarching narrative that is split into smaller sections in first- and third-person narration. The stories read almost like standalone stories, and I appreciated that format because each section felt immediate and personal. These stories, including the overarching story, show the masterwork of a literary butterfly effect. Each of the decisions the characters make affect their own lives and the lives of those around them, and we as readers are invited to consider those decisions in tandem with the decisions and the effects those choices have on our own lives. Joan Silber’s Improvement explores the connective power of love and the changes — no matter how large or small — love brings into our lives. Love improves us if we only let it in. Thank you to Counterpoint Press for sending me a free copy in exchange for a review!